The 2018 MLS regular season saw nine referees officiate a career-best number of games, and of those, two have broken the 20-game barrier for the first time in their career: Ted Unkel and Drew Fischer. In beating his previous best of 18 from 2013 Fischer recorded a century of MLS center assignments when Columbus Crew hosted Philadelphia Union in Week 31. In the context of either team’s season, the defensive stalemate was perhaps one that won’t live long in the memory for too many who were present, except perhaps for Fischer, even if he didn’t realize it at the time. “I was told back in May I was getting close and there would be a chance I could get there this season,” the Calgary native explained. “I’d put it to the back of my mind, so it crept up on me. When you start out you move from counting the games to realizing a season has passed you by but the thought of 100 games in the early years seemed crazy. After taking charge of his first MLS game in 2012, the 38-year-old was appointed to the FIFA panel three years later and he continues to relish the challenge of a sport that is evolving at a rapid rate, whether that is the demands of being a center referee or having the flexibility required to administer different roles throughout the season. 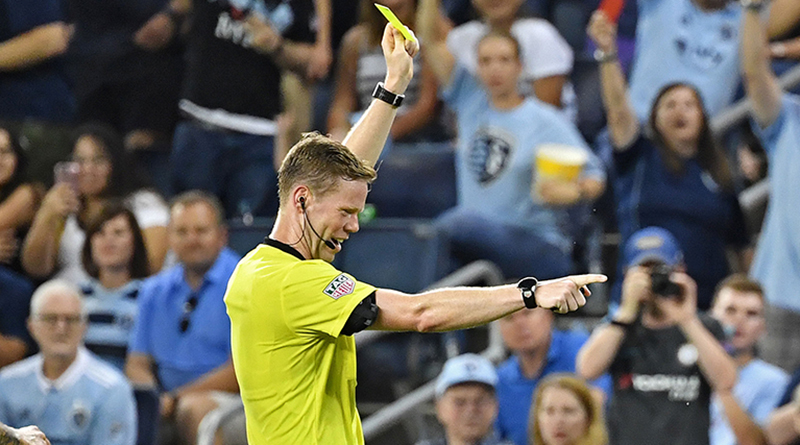 “I started six years ago in the MLS, five years after my first USL game and that doesn’t feel like a long time, but when I look back to where I was as a referee and where the league was at that point, there’s a lot that’s happened since then. “I’m a far better referee now than I was 100 games ago, that’s for sure, and the rate we are developing has increased in that time as the season’s progress. “The game is so much faster, and that has a huge impact. From our side, that gets reflected in the way we choose to position ourselves now, and the way we run is dramatically different from how we were doing it a decade ago, just as it is for the players themselves. “The differences are remarkable if you go back and watch a game from 10 years ago and some elements of it seem totally foreign now. We have a crew of six now because of Video Review and that means more people working towards the same goal. That brings more perspective and it’s fun to be a part of – that expectation [to make the right call] will continue to push us. “There’s a whole host of people there that have helped along the way to get to 100 and I owe some measure of gratitude for those who either helped me become a referee or for giving me the opportunity to progress.